Here I’ll be blogging about random things related to the podcast and the development of Omnivore, the Atari 8-bit Binary Editor. Created and installed Track & Field panels on my upright cab and thinking about hacking the rom to make it easier to qualify for my kids. I loaded the resulting file up into Omnivore and it now displays a reasonable 6809 disassembly! I don’t know 6809, but it looks like code, anyway. Stay tuned! As mentioned on the latest episode of the ANTIC podcast, Kevin and I have been reverse engineering Jumpman. We’ll have lots more to announce soon. I’m interested in hacking around with Jumpman, perhaps seeing if it’s possible to create new levels. Reverse-engineered source code for PC version. Perhaps there are similarities in the level format? repeat for ladders, ropes and bombs, in that order specificly. Length for girders is horizontal, everything else is vertical. UPDATE: I found the RetroPie Setup Script that looks like it has been modified to use the display_width and display_height variables as inputs to the vector width and height! So this hack doesn’t appear to be needed in RetroPie distributions that use advmame 1.4! Here’s one of the cool things that happens automatically in Omnivore. This example is an Atari DOS file, so the last 3 bytes of each sector are used for pointing to the next sector and specifying the number of bytes used in this sector. Operating in the ordinary sector editor mode would overwrite this metadata if you selected all the sectors. You can do multiple selection now, but why do it by hand? You can then use the normal byte operations on the selected region and the metadata between sectors is not affected! I’m in the middle of adding multiple selection to Omnivore: you’ll be able to select multiple disjointed regions and operate on them using a single command. You’ll be able to invert the selection, and I’m thinking about how to add an algorithmic selection to be able to specify, say, all the bytes with values greater than 0xa0, or all the bytes with addresses that end in a 0x3. Fun stuff like that! I interviewed Mark Reid for an upcoming episode of the podcast, and we talked about if he had thought about adding other maps or other cities to the game. Memory limitations precluded that, but he described how the maps were stored and how the AI worked with the map, so it would be possible today to create customized maps! The previous several entries in the blog was the log of my entry in the RetroChallenge 2016/01. I have not been making a map for Getaway! I have been making a map editor. It is still beta-level code, so testing and bug reports would be appreciated! You can see the project on github. Binaries are available for windows and OS X. Currently, Linux users must install from source: first install python 2.7, then wxPython, and use pip to install numpy, cython and finally omnivore. Wade of the Inverse ATASCII Podcast has been using the editor to create the first custom map for Getaway! It is available on the AtariAge forums. 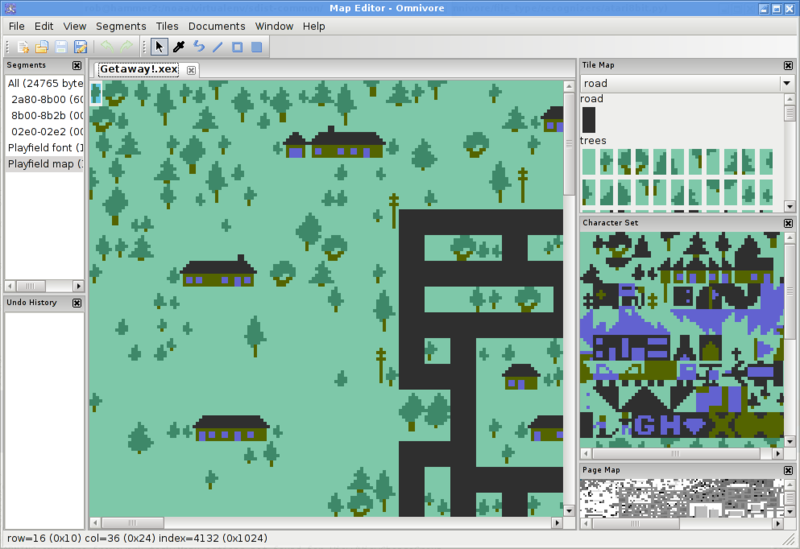 Full disclosure: I have been writing the framework for quite a while, over a year, but started the map editor portion for the RetroChallenge. This is the first public announcement of this project, right here at this RetroChallenge. although that’s not entirely true. We’ve seen that the gas station characters work and the home base characters work to a lesser extent. 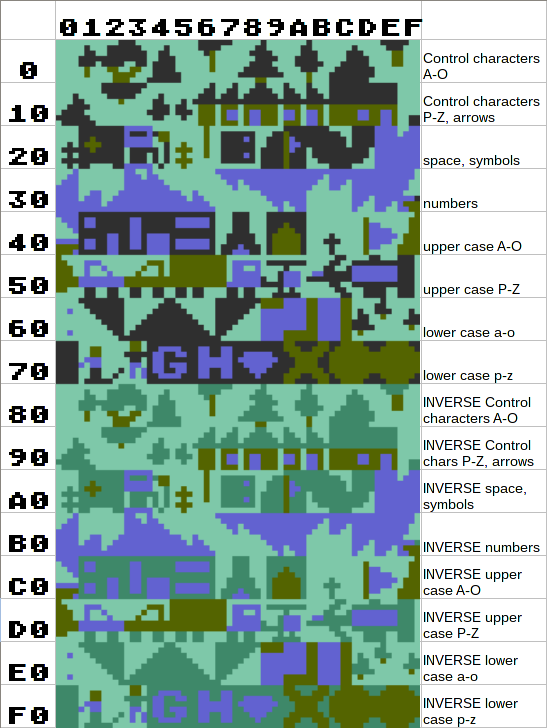 If you’re not familiar with the Atari character sets, there are 256 characters but only 128 have unique bit patterns. The second 128 characters use the same bit patters as the first 128 but the Atari hardware interprets them differently. In ANTIC mode 2 (e.g. 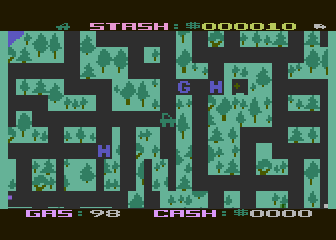 BASIC Graphics mode 0, the normal text mode), the second 128 are inverse characters. In ANTIC modes 4 and 5, colors are determined by pairs of bits. The first 128 characters use playfield colors 0 through 3, and the second 128 have a slightly different usage of the palette: bitpairs that have both bits turned on will use playfield color 3 instead of playfield color 2. 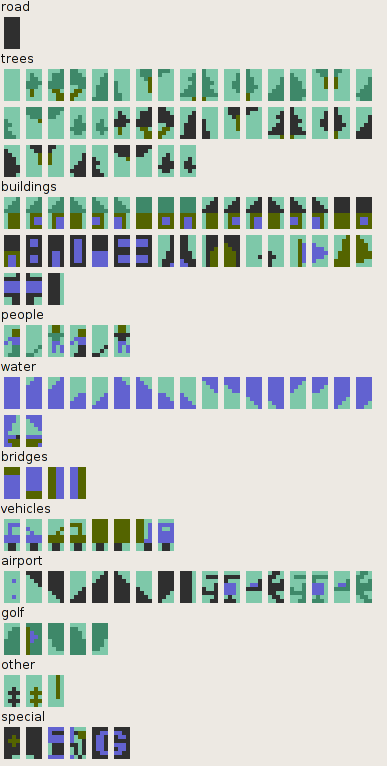 The bulk of the characters are just background tiles to represent different bits of the city: the trees, the buildings, aircraft, etc. 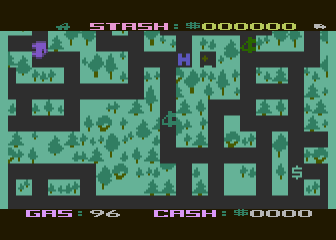 The special tiles for the gas stations and your hideout are in the 0x70 row, and we’ve already seen that the roads are the `p` character. The new gas station and the new hideout both appear, but the old hideout is redrawn and you start at the original location. I think this is due to the fact that the game only allows you to stay in your hideout for a limited amount of time. When you are in your hideout you are invulnerable to the police, and the game and will erase the hideout and remove that safety if you sit there for too long. I’m not sure the exact amount of time, but the hideout building (not the `H`) will begin flashing when you have a few seconds of safety remaining. The new hideout location does act as a safety, though, and the new gas station does work. So it appears that the hideout location is hardcoded somewhere, but as far as I can tell at this point, that’s the only thing that is. The game probably redraws the hideout at the beginning of each game in case the last game ended with the hideout being hidden. The game crashes after a little bit of time. I’m not sure if it’s because of the new roads or the new gas station/hideout modifications. Obviously it’s something I did because the unmodified game will run forever. UPDATE: it’s the roads. Apparently, you can’t have a dead end. The computer controlled cars don’t handle dead ends at all, the game just goes into an infinite loop when the car reaches the end of the road. So, I’ll have to make sure that my new roads don’t have any dead ends anywhere. 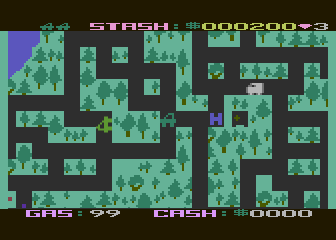 So, to recap: the hideout has to stay in the same location (presupposing that I’m not going to tackle the originally-out-of-scope task of hacking the program) and roads can’t dead end. Got it. 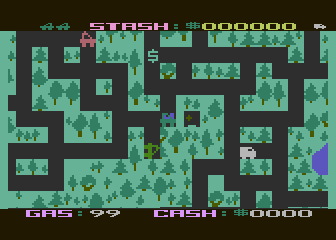 The game is in ANTIC mode 5, which is the 40x12 mode (in full screen) where the characters are twice as tall as they are wide. 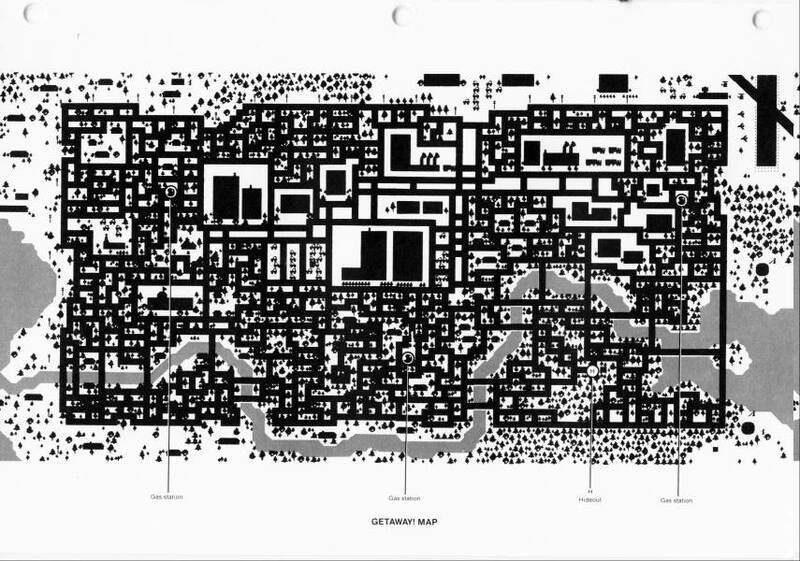 At the pixel level, they are graphics 7 pixels, two scan lines tall and one color clock wide. Each unit of road in the game is two characters wide and one character tall. In this test there are several roads starting on even or odd character boundaries, and it looks like the road detection is only performed on the even character; that is: the character that makes up the left half of the road. The narrow roads on an odd character are not passable; it acts as if it were not there and the car can’t be turned down that road. The narrow roads on an even character are drivable, despite your car running over trees on what would be the right half of the road. 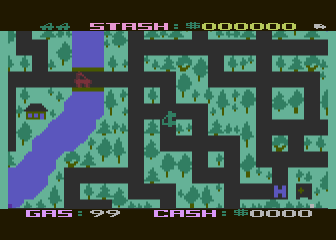 So without modifying any assembly code, I will have to limit my map modifications such that the roads are two characters wide where the left character is on an even cell number. 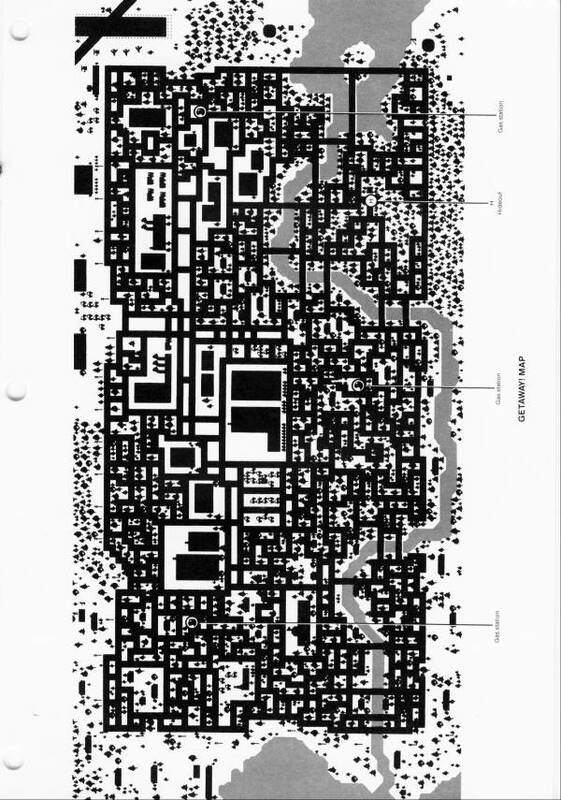 Talking with Mark Reid in my (forthcoming) interview with him, he stated that everything that the program needed to define the roads was purely in the scrolling map data as stored on disk; there is no other metadata associated with it. So, changing the characters should result in a new map. The classic game Getaway! was written by Mark Reid, published by the Atari Program Exchange (APX) and won the 1983 Atari Star award for best software published through APX that year. 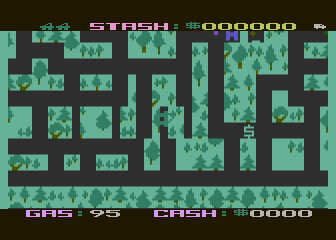 It’s sort of a very large scrolling Pac-Man type game, where you drive your car collecting loot that randomly appears in locations all over the city, refueling at gas stations when necessary and depositing your ill-gotten gains at your hideout to increase your stash. Roaming police vehicles will arrest you if they catch your car. 02F4: 14 00 00 00 00 00 80 00 FF 00 00 00 31 01 52 01  ............1.R.